In Part 1 we talked about location, temperature and light. Pretty easy since most houseplants have the same requirements as people. This week we’ll address watering requirements and practices. Watering is the main cause of death for plants. Plants, like people, need to stay hydrated but also like people, they can become bloated and suffer from edema. Drainage is important. Imagine if you had no way to eliminate fluids. Yeah. Not good. Not good at all. If your gorgeous pot has no drainage holes, you have to make sure that you allow the soil at the bottom to dry out, otherwise it’s like sitting with your feet in water for weeks. The best course is to keep your pot planted in the inexpensive plastic pot it came in and set that inside your pretty ceramic pot. This way, you can remove the plant in the pot, water it thoroughly (soaking it for a few hours in a sink half full of water so it can drink as much as it needs is a good option) and then return it. If you can’t remove it from its no-drainage pot, take a dull knife and make a hole big enough to get your fingers down to the bottom to see if there is standing water. If just a little, let it dry out. If it’s deep standing, stinky water, you have to pull the plant out and dump that water and clean the pot. Leave the plant out for a few days to dry out before returning to pot with some fresh potting mix and a little water, then return to a regular watering schedule (obviously less than you were giving it!). If your plant/pot has good drainage, you should plan to water it about once a week. It needs a good healthy drink to make sure all the soil can fully absorb the water. 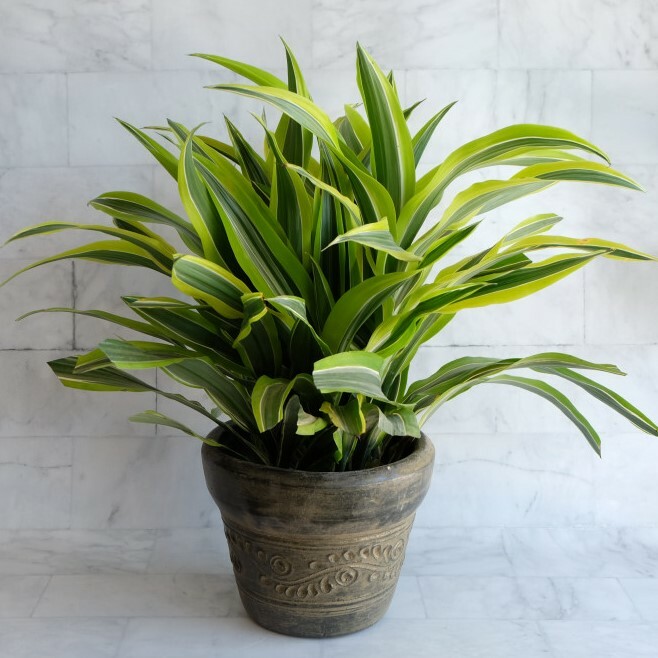 If the plant has been left without water for a long period of time, the soil may be so dried and hard that the water simply runs between the dirt and pot and is not absorbed. If that is the case, let it sit in the sink or a bucket of water until the soil is soft and crumbly (overnight works), you might need to wait a week or so and then soak it again, just to get it fully hydrated and back on track. One thing to avoid is the under/over watering cycle. Much like people who yoyo diet, your plant may live but it won’t be happy. Underwatering results in old mature leaves turning yellow, overwatering results in new growth coming in yellow and you’ll find roots/leaves that are mushy and water logged. If you’ve been yoyoing, you might find both. If there is not standing water/soggy soil/bad smell, the treatment is to fully soak the plant, wait a week, soak it again, repeat, repeat. Do this for a few weeks until it’s healthier and then go back to a once a week watering schedule. If there is nasty, smelly, water – leach the plant several times under running water to get rid of the stagnant water, let sit and don’t water for several days until it starts to dry out, then start watering weekly. We’re going to assume you now have your plants in good locations and are watering correctly, Part 3 will talk about feeding and maintenance of your healthy houseplants.